Albert W. Schroeder and his wife Julia are buried in Chicago’s Mount Olive Cemetery. Their headstones were among 600+ photos I took for Find A Grave in that cemetery in April. The emblem on Albert’s headstone intrigued me. If the dates on his headstone are correct, Albert was only 19 years old when the Spanish-American War broke out. I wanted to know more about this man. The first record I found on FamilySearch for Albert was his World War II registration card . From this I learned where and when he was born. I also learned Albert wore glasses, was five feet eight inches tall and weighed 142 pounds. In other FamilySearch records I discovered Albert and Julia were married in Indiana in 1911 . Why there I wonder? The couple had two sons; Albert W.  who was born 09 Dec 1912 (and died the same year) and Robert Frederick born 21 May 1914 . In 1918, Albert registered for the World War I draft . How interesting that here he uses a middle name. I wonder why years later he went so far as to write “initial only” on his WWII registration? Although I didn’t find a definitive record for Albert’s Spanish-American War service, I did learn a few of the stories under these headstones. “United States World War II Draft Registration Cards, 1942,” database with images,FamilySearch (https://familysearch.org/ark:/61903/1:1:V1KN-DD1 : accessed 15 August 2015), Albert W Schroeder, 1942; citing NAID identifier , NARA microfilm publication M1936, M1937, M1939, M1951, M1962, M1964, M1986, M2090, and M2097 (Washington D.C.: National Archives and Records Administration, n.d.); FHL microfilm . “Indiana Marriages, 1811-2007,” database with images, FamilySearch(https://familysearch.org/ark:/61903/1:1:VNT6-9LN : accessed 15 August 2015), Albert W Schroeder and Julia M Metzner, 21 Jan 1911; citing , Lake, Indiana, county clerk offices, Indiana; FHL microfilm 2,414,593. 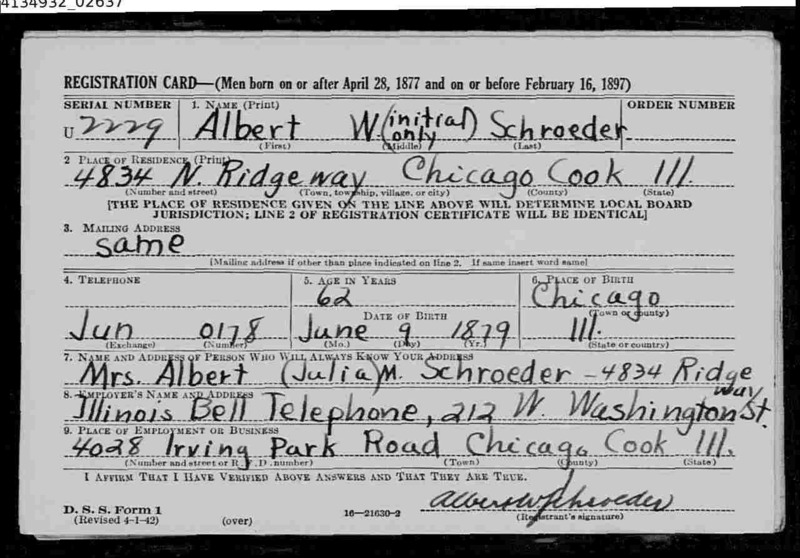 “Illinois, Cook County Birth Certificates, 1878-1938,” , FamilySearch(https://familysearch.org/ark:/61903/1:1:N7M3-THX : accessed 15 August 2015), Albert W Schroeder in entry for Albert W Schroeder, ; citing Chicago, Cook, Illinois, United States, reference , Cook County Courthouse, Chicago; FHL microfilm . “Illinois, Cook County Birth Certificates, 1878-1938,” , FamilySearch(https://familysearch.org/ark:/61903/1:1:N7M8-4PJ : accessed 15 August 2015), Robert Frederick Schroeder, ; citing Chicago, Cook, Illinois, United States, reference , Cook County Courthouse, Chicago; FHL microfilm . 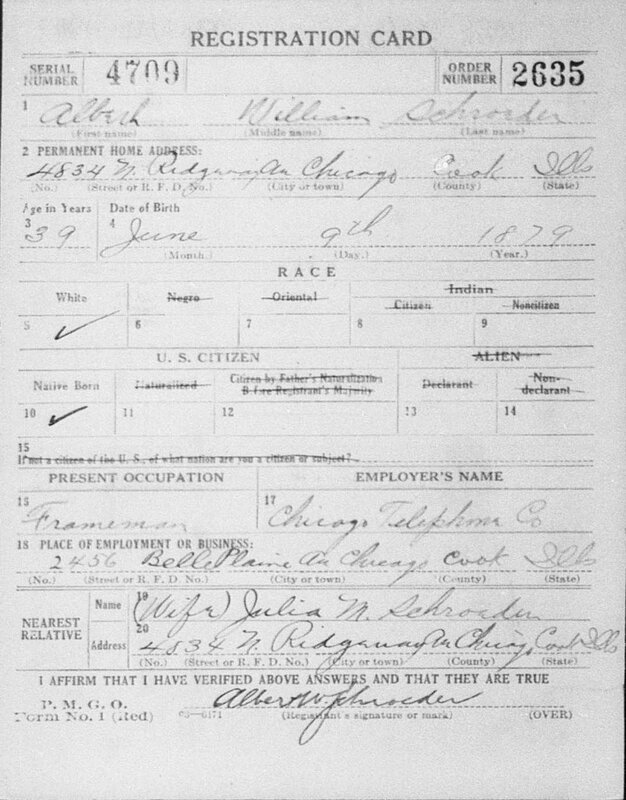 “United States World War I Draft Registration Cards, 1917-1918,” database with images,FamilySearch (https://familysearch.org/ark:/61903/1:1:K6DN-QQ1 : accessed 15 August 2015), Albert William Schroeder, 1917-1918; citing Chicago City no 61, Illinois, United States, NARA microfilm publication M1509 (Washington D.C.: National Archives and Records Administration, n.d.); FHL microfilm 1,613,747.